Mrs. Fisher's fanatics, unite! Order your own Mrs. Fisher's T-Shirt in Yellow, Red, Blue or Black today. 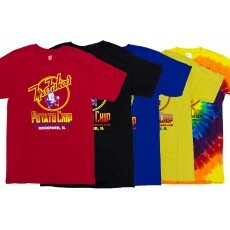 Our T-Shirts make the perfect gift (and you may even want to throw in a bag of chips). Don't forget to send us pictures in your Mrs. Fisher's gear, we love to see our loyal customers and you may just be featured on our website!